Rome's latest political crisis comes at a time of elevated tensions between euroskeptic populists, who emerged victorious from the March election, and pro-EU establishment lawmakers. Carlo Cottarelli, who became known as "Mr. Scissors" for his reputation regarding cuts to public spending in Italy, is now tasked with the planning of fresh elections and passing the next budget. The euro tumbled to a fresh six-month low on Tuesday, while yields on Italian debt climbed — ratcheting up the extra borrowing costs or spread that Rome pays in comparison with Germany. Italy's Five Star Movement leader on Monday called on supporters to protest peacefully, a day after a standoff with the president forced it to abandon efforts to form a coalition government with the far-right Lega. "Let's not give up now, we must not give in to the arrogance of the institutions which have decided to keep people from making decisions for their own country," Luigi Di Maio said, speaking live on Facebook. "Make some noise, it is important that we do so all together," Di Maio added. Italy’s political situation is a bit of a mess at the moment to say the very least. They haven’t had a government since March. And their latest attempt at a government has collapsed after just four days, forcing the new Prime Minister Giuseppe Conte to quit. One man at the epicentre of the crisis is the popular right-wing politician Matteo Salvini, a major critic of the EU and immigration, but a big fan of Donald Trump. He has served as Federal Secretary of the political party Lega Nord (Italy’s more popular version of UKIP) since December 2013, and is now struggling to form a government correctly with various rival parties. As of March this year he became a Senator in the Italian Senate too. Here is what we know about him. Lega, led by Eurosceptic Matteo Salvini, managed to bring in votes from other parties, including Forza Italia, which saw votes drop to 8 percent and Fratelli d'Italia which decreased to 3.8 percent. With the rise in Lega's favour, the party is now neck in neck with Five Star Movement, whose popularity has decreased from 31.1 percent in 2016 to 29.5 percent in this year's new polls. In the poll run by Swg and commissioned by TgLa7, Lega now stands at 27.5 percent of votes coming in second to coalition partner M5S, as the country prepares for a re-run of the election next year. The right-wing party received majority of its votes from the centre-right, as Mr Salvini, popular right-wing politician is slowly gaining electoral support in Italy. Italy has been thrown into political crisis after a stand-off between the president, Sergio Mattarella, and the leaders of the Five Star Movement and Lega Nord over their pick for finance minister, Paolo Savona. Mattarella refused to accept Savona’s nomination on the grounds that the 81-year-old former minister has never retreated from his belief that an exit from the euro must be done by stealth, and Five Star/Lega Nord both refused to name another candidate. As a result, Mattarella refused to allow the parties to form a government, and has named Carlo Cottarelli as interim prime minister. 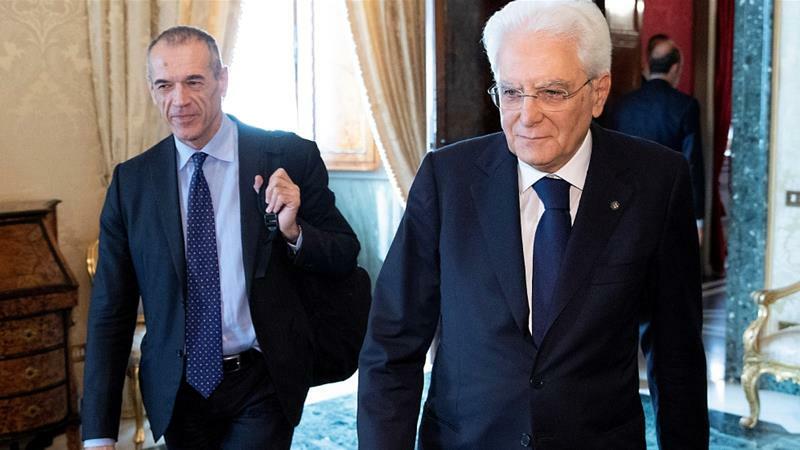 Cottarelli is absolutely certain to fail to name a government capable of commanding parliamentary approval and Italy will head to a fresh set of political elections. (Al Jazeera) After months of political deadlock following an inconclusive election, Italy is on the verge of a major political crisis with global implications. Earlier this month, the far-right League party and the Five Star Movement - which practices a new breed of "centrist populism" - proposed a new government that European Union officials saw as a threat. Fears over Italy returned with a vengeance Tuesday, perhaps surprising U.S. investors returning from a three-day Memorial Day weekend as headlines out of Rome sent shock waves through global markets and contributed to a selloff for Wall Street stocks. Market participants don’t need a long memory to recall the worst days of the eurozone debt crisis in 2011 and 2012, when fears centered on Italy’s massive debt pile, teetering European banks and sluggish growth took center stage. Those worries were effectively pushed into the background in 2012 by the European Central Bank, but they weren’t resolved. And now they’ve resurfaced, at least temporarily, with a political twist. Nearly a decade after a protracted Greek debt crisis spooked global markets, a fresh round of political turmoil in Italy has revived fears about the fate of the European financial system and its common currency. This time, the numbers are a lot bigger. "Italy's economy is 10 times larger than that of Greece, whose debt crisis shook the euro area's foundations," wrote Desmond Lachman, a resident fellow at the American Enterprise Institute, in a recent blog post. "The single currency is unlikely to survive in its present form if Italy were forced to exit that monetary arrangement." See the thread about the Greek crisis as it was happening! A coalition government has been agreed in Italy, ending months of uncertainty in the EU's fourth-biggest economy. Prime Minister-designate Giuseppe Conte presented his list of ministers to President Sergio Mattarella for the second time in a week and the new government will be sworn in on Friday. Ministers are drawn from both the anti-establishment Five Star (M5S) and the right-wing League. Attempts to form a technocratic government had failed. Mr Mattarella rejected Mr Conte's original choice for economy minister but a different candidate was agreed on Thursday. In a conference earlier on Thursday, the president of the European Commission, Jean-Claude Juncker, was reported saying that Italians had to work more and fight corruption to improve the situation in the country’s impoverished south. REMEMBER the pain inflicted on the world by the Greek debt crisis? It wrecked the economy of most of Europe, caused our dollar to fall and made our stockmarket plunge. Now Italy is the concern — Europe’s nightmare scenario. If Greece was a sardine, Italy is a whale. Here are some comparisons: Greece’s economy is less than one-third as big as Australia’s. Italy’s is 1.5 times larger. That’s why the potential for crisis in Italy is already making massive waves. Stock and bond markets have already fallen around the world. The crisis might not come to pass, but if it does, all hell will break loose. That will be bad news for Australia — we have enough to deal with given rising unemployment, risks in China and the implications of a cooling housing market. 'Anti-establishment government'. Sounds like an oxymoron to me. An anti-establishment government, it seems, is the new establishment. You could theoretically have an anti establishment government, but it would be the same as theoretically having successful Communism, both would only work if you removed Humans from the core. Italy’s interior minister, the far-right firebrand Matteo Salvini, has declared that one of the new populist government’s top priorities will be to “send them home”, signalling that he intends to keep a campaign promise to round up hundreds of thousands of undocumented immigrants in Italy. The political chaos that has engulfed Italy in recent weeks has centred on questions about whether the government, which was sworn in on Friday and is led by the virtually unknown prime minister Giuseppe Conte, will take a tough line on Italy’s fiscal commitments in Brussels. But Salvini’s rise to power, from talk-radio host on his party’s show to his appointment to one of Italy’s most powerful government positions, with oversight of domestic security, civil rights, immigration and asylum and elections, could force more dramatic change. German Chancellor Angela Merkel said in a newspaper interview the principle of solidarity among members of the euro zone should not turn the single currency bloc into a debt-sharing union. "I will approach the new Italian government openly and work with it instead of speculating about it intentions," Merkel told the Frankfurter Allgemeine Sonntagszeitung in an interview to be published on Sunday. Italy accounts for 23.4 percent of the euro zone's public debt and 15.4 percent of the bloc's GDP, according to Eurostat. A new Italian government was sworn in Friday in Rome after months of political turmoil that unnerved investors and sparked worries that the eurozone’s third-largest economy could ditch the currency. Two major populist parties, the Five Star Movement and the far-right League, have emerged from the tumult to form an administration. The parties have dropped some of their most explosive campaign pledges, such as calling for a referendum on whether Italy should abandon the euro, or leave the European Union. Analysts say they’re planning tax cuts and a spending binge that could contain the seeds of a new European crisis. as the docile front for an austerity agenda set in Brussels and Berlin. Against this, on March 4, the Italian voters finally rebelled. between the two parties that dominated the election: the hard-right Lega and the Five Star movement, which, though not wholly progressive, seems to have drawn Italy's creative forces to its banner for the moment. up in the national polls. It looks like the new government's anti-immigration stance is more than just words and campaign promises. It would have been better had their stance just been rhetorical. Certainly better for prospective immigrants. CASTELBUONO, Sicily (Courthouse News) — Italy’s new right-wing interior minister Matteo Salvini is keeping to his hard-line campaign promises and has begun to close his country’s borders to refugees and immigrants from war-torn and impoverished African and Middle Eastern nations. Salvini announced on Sunday that Italy would not allow the humanitarian ship Aquarius, with 629 immigrants and refugees aboard, to dock at an Italian port. On Monday, the interior minister vowed to stop a humanitarian group called Sea-Watch from bringing people it was picking up off the Libyan coast to Italy. This hard-line approach was backed up by his governing counterpart, Luigi Di Maio, the leader of the 5-Star Movement, and Italy’s new premier, Giuseppe Conte. 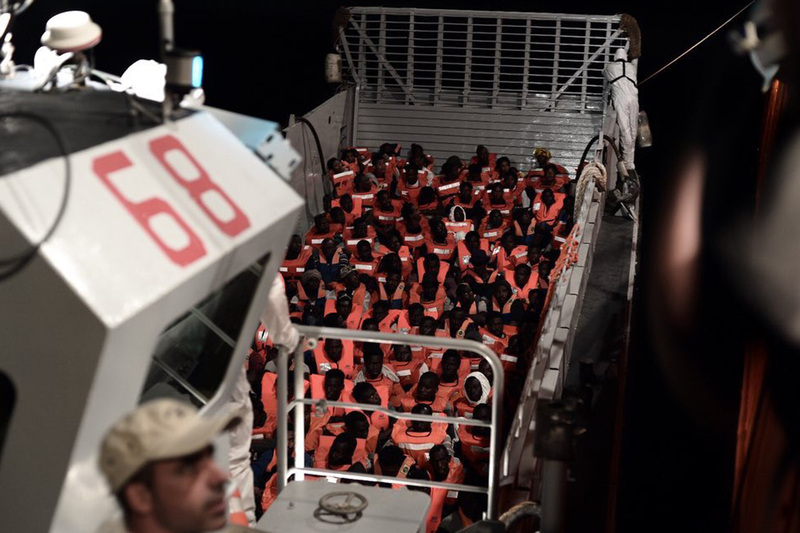 Undated photo released by French NGO SOS Mediterranee on Monday shows migrants about to board the SOS Mediterranee’s Aquarius ship and Doctors Without Borders NGOs, in the Mediterranean Sea. (The Intercept) ITALY’S FAR-RIGHT interior minister, Matteo Salvini, who seems ready to vie even with his hero Donald Trump in cruelty toward the most vulnerable, declared victory on Monday in his campaign to defy international law by refusing to accept more than 600 migrants rescued from the Mediterranean this weekend. Salvini, who is also Italy’s new deputy premier, put his Trump-inspired “Italians First” campaign slogan into practice over the weekend by closing the country’s ports to a rescue ship, the Aquarius, which is carrying 629 migrants saved from drowning, including 123 unaccompanied minors, 11 babies, and seven pregnant women. The migrants were left stranded at sea, with no idea where they might land until Spain’s new socialist prime minister, Pedro Sánchez, intervenedon Monday to offer the migrants safe haven in Valencia. Spanish journalists on board the rescue vessel have reported the increasingly desperate plight of the migrants over the past 24 hours. Valencia, however, is 800 nautical miles away from the point between Italy and Malta, where the ship has been stranded, and took on emergency rations of food on Monday. Italy’s new far-right interior minister has announced a “census” of the country’s Roma community and set the stage for deportations of the ethnic group. Matteo Salvini, the leader of the far-right League party, said those Roma found to have Italian nationality would “unfortunately” be allowed to stay in the country while others would be expelled. The new anti-Roma policy is one of the first acts of Mr Salvini’s interior ministry; his party formed a coalition government at the start of June with the anti-establishment Eurosceptic Five Star Movement. “The way is short from a census to a concentration camp. Salvini apparently decided to celebrate the 80th anniversary of the racial laws,” Chiara Gribaudo, a deputy from the centre-left Democratic Party said, referencing the Mussolini era. Why exactly do Europeans hate Roma again?